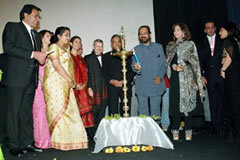 The Pune International Film Festival was held between January 14th & 20th, 2005, featuring 130 films from about 30 countries enjoyed by over 3000 registered Delegates. PIFF started off with the screening of the hilarious French comedy If I Were Rich directed by Noelie Chicca Ungaro , as the inaugural attraction at posh city multiplex E-Square and the concluding film was Showman Subhash Ghai's Kisna world premiered at another city Multiplex Inox. The Jury headed by American Milt Shefter, comprised of the Egyptian cinematographer Ramses Marzouk, Iranian director Pouran Derakhshandeh, Israeli director Dan Wolman, veteran film archivist P.K.Nair and film critic Gautaman Bhaskaran. The Oscar Nominee contenders walked away with the awards at the PIFF. Yesterday from South Africa won the $20,000 Maharashtra Government Prabhat Best International Film Award , Peruvian director Josue Mendez walked away with the $10,000 Maharashtra Government Prabhat Best Director Award for his film Days of Santiago . Afghanistan's Earth & Ashes bagged the Jury's Excellence In Filmmaking Award while Local Stars Ashwin Chitale and Arun Nalawade shared the Jury's Certificate of Achievement in Acting Award -�acting that seemed natural so that the audience cared about the characters in the film Shwaas�. The Jury Award in cinematography went to Chinese cinematographer Wang Wei for �talent of the eye for capturing images that showed a stark reality of the exteriors and interiors of a village in Endless Wait� Among the films screened in the World Cinema section, the best were, Ben's Biography, Bombay Dreams , Wind Bird, Judge Mama, Pretty Big Feet, Swimming Pool, Beautiful City, and Utopia while Nickel & Dime, A Real Man, His Brother, French Men, Only Girls etc were screened in the section France-New French Films. 17 Fois Cecile Cassard, Sea Side, A Piece of Sky, Mon Idole, Se Souvenir Des Belles Choses etc were showcased in the Focus on France-Young Directors section. The Competition section introduced from this year onwards in time to celebrate the 75 th year of Prabhat Film Company, comprised of 21 films. Among them were Amu, Earth & Ashes, Endless Way, Father's Garden, Finding Home, Going Home, Control, Ring of Fire, Shwaas, Small Town, South of The Clouds, The Rider Named Death, Ticket to Jerusalem, Yesterday and Hold On To Your Hat. However Superstar Dharmendra who was the chief guest at the star studded inaugural function stole the hearts of Local Film Lovers when he declared Pune as most vibrant city; where he had started his career when he shot for a song for his debut film Shola Aur Shabnam at Prabhat Studios. On the whole The Third Pune International Film festival proved to be a feast for Cine Lovers.